It’s grey and rainy here, yet I notice there are many plants which can brighten up this kind of weather, and some which even improve in the wet. 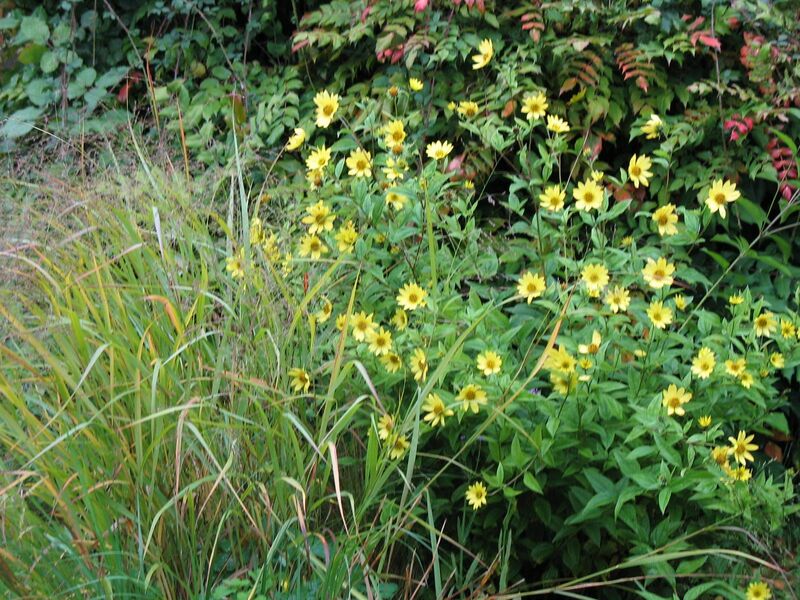 Here are some specific plants and some general ideas for your wet autumn garden. I first noticed my perennial sunflower, which is in full bloom now. I don’t know why these aren’t more popular: mine doesn’t need staking, doesn’t need any attention, and is out at a time when few other things are blooming. Its pale yellow harmonises with the purples of Michaelmas daisies and other asters also out now. I have it behind two lovely grasses, one of which, a miscanthus, has just produced its pinkish cream flower-heads. The other droops in front but on dry days waves and flutters beautifully and is a light cream colour. Another nice combination is a deep red Japanese maple in a pot in front of vitis vinifera ‘Purpurea’, which is deep purple and will become red later in the season. Its leaves glisten in the wet. Smooth, leathery leaves come into their own in the rain as they glisten, highlighting their texture and reflecting light. 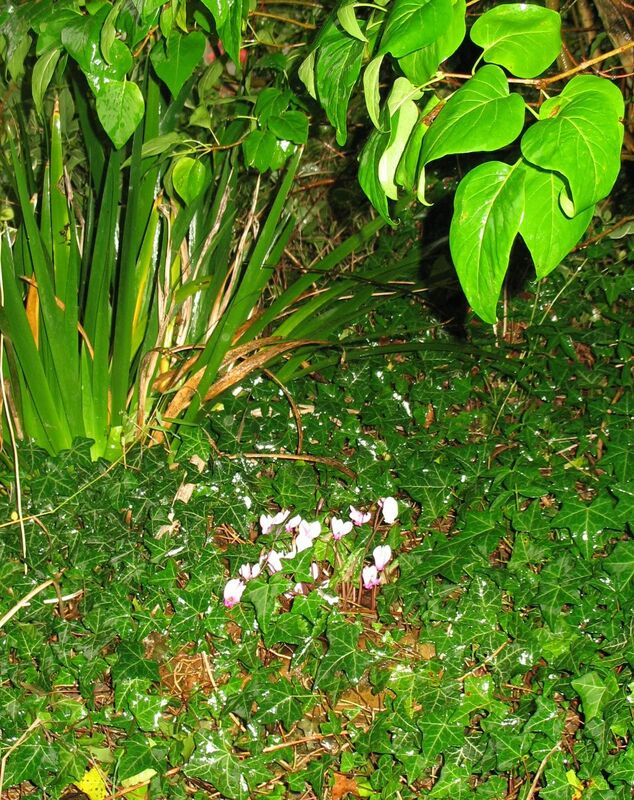 My ivy and holly do this, and in amongst the ivy is the pink-flowering bulb cyclamen hederifolium – a lovely surprise peeping out from under the tree. Variegated leaves will brighten up a dull day – I have a variegated holly tree (also lovely in the sun as the smooth leaves reflect the light) as well as variegated periwinkle (vinca major) and ivy. Yellow evergreen shrubs are useful all autumn and winter. 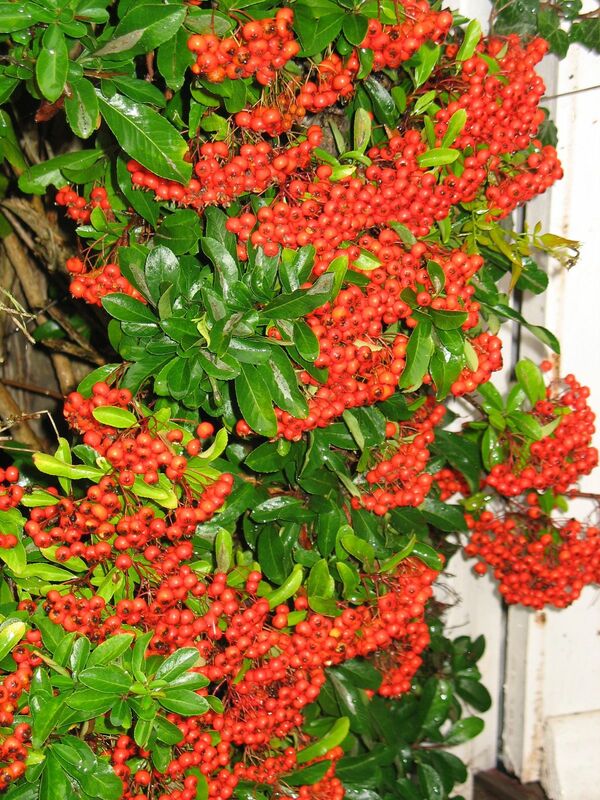 Try golden privet, lonicera, or the yellow form of Mexican Orangeblossom (Choisya ternata ‘Sundance’ for example). 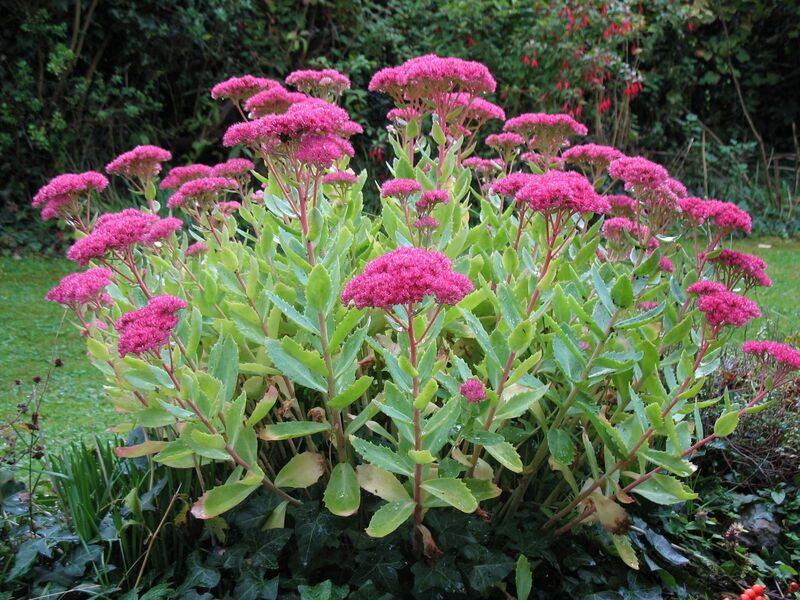 Other plants in flower now are the sedums. The common ‘sedum spectabile‘ with pink flowers and light green fleshy leaves looks good in the rain, and in the hedge my simple fuschia is glowing with pink and purple flowers. Also the Geranium ‘Brookside’ is reflowering nicely. Then there’s the hips and berries – this is the best time of year to see them, before the birds eat them all: hawthorn; rosehips, especially of dogrose; pyracantha berries galore. And enjoy the fruit on the tree – apples and crabapples look very decorative right now. I’m off to pick my autumn raspberries – enjoy the rain! Jane, this blog is so helpful to gardeners and so very interesting to me, stuck in an apartment block in Jerusalem. It also makes me long for England! Your working garden is an inspiration for everyone to show people how to make the most of growing good vegetables and fruit, as well as providing wonderful scenery. Thanks very much Jan. I’m glad I photographed the rosehips, as apparently because of the mild weather around flowering time, this is a great year for berries and fruit. Certainly my old apple tree has overproduced. 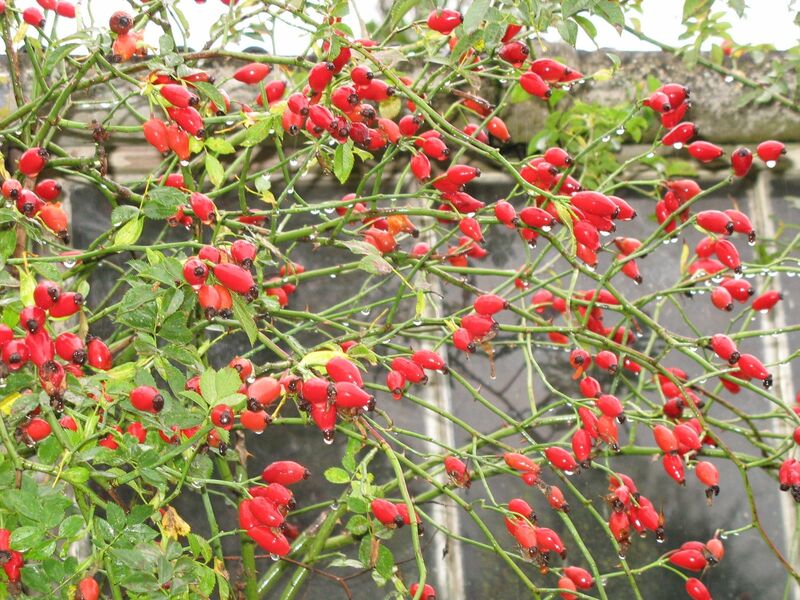 And I see the rosehips through the garage window every time I start up the car, which is nice. …Hope you are able to have or get access to a garden soon.